Consider, ye initiate, the black art that is storytelling. The mystic weave of elements into spells of such power they can draw their unsuspecting targets into other worlds, other lives, or even other times! Yet do not despair, initiate, for there is another way! 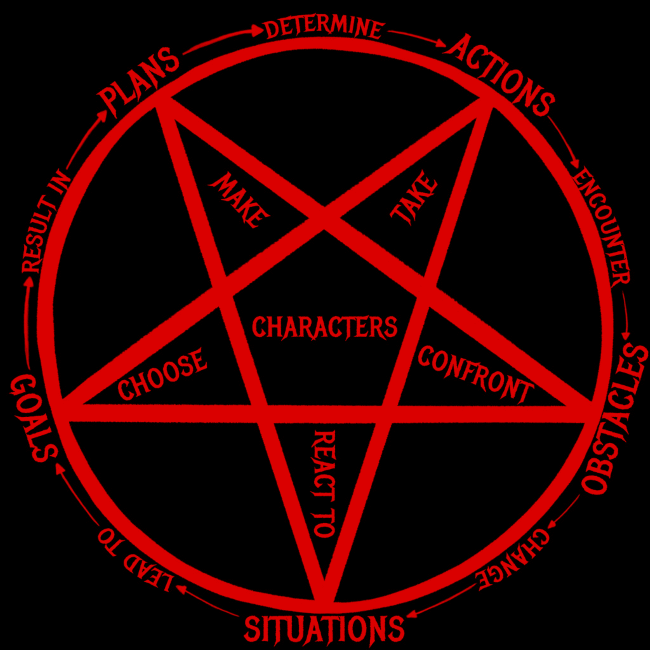 Little known to even the highest magus and maga, the six elements of story, when properly understood, weave their ley lines into an epic talisman. Behold, the Pentacle of Plotting! These six are the key, initiate. Learn their qualities and relations well! Characters: At the center are the characters, for they give life to every tale, and without them there is no tale to tell. And characters, at the pentacle's heart, stand in active relation to the other five. The other five elements orbit the heart in endless retinue, evolving from one to the next as they step point-to-point around the pentacle. Goals: Characters choose their goals, for is it not true that every man, woman, and child among us is driven by our own innermost desires, which arise from the situations we face? Know your characters' desires that ye may know their goals, which give direction to everything they do. Plans: Characters, as the motive force, transmute goals into plans by which their innermost desires--be they base or noble--may be achieved. Actions: A lively character, one with the vigor to power storytelling's spells, does not sit as some idle lump on life's sidelines. Nay! Such characters stir themselves to action, guided by the plans they have made. Obstacles: Yet all is not under the character's control! For as the struggle makes us strong, as it gives our blood the potency to change the very world, so too a character's struggle gives them the power to propel the wizard's targets into those other world and other lives. And thus, though a character has set themselves a task and thereby taken actions, so it must that those actions run headlong into challenge. Weak and insipid is the story born of actions that conclude without issue! Situations: The scope of a character's actions is constrained by their situations. And the obstacles that you, initiate, will set in their path shall change the situation in ways unforeseen by the characters, thus leading to new goals, new plans, and new actions! This, then, is the arcane engine powering the storyteller's art. The Pentacle of Plotting is thus revealed, its elements artfully arranged to reveal the web of power they contain. But to not rest cocksure in this new knowledge, for the Pentacle of Plotting has not yet revealed all of its secrets. Journey on to the next lesson to learn what else the Pentacle reveals about our beloved, black art of storytelling.